The Korean Craft and Design Foundation (KCDF) presents ‘Between Serenity and Dynamism; Korean Ceramics’, an exhibition that explores the beauty and heritage of Korean ceramics, and the contrast and harmony between the traditional and more contemporary forms of the craft that exists in Korea today. The exhibition – first to be shown at Salone del Mobile in Milan in April, before travelling to London for the launch of London Craft Week (3-7 May) – will showcase the work of some of the most important ceramic masters and artists currently working in Korea, and features many collectable items on loan from museums, galleries and auction houses around the world. Over the years there has been a divide in Korea between makers and potters continuing the traditional form of the craft and the more contemporary form of the craft, taught in universities, that has been adopted by Korea’s newer generation of contemporary artists. Curated by contemporary Korean craft and ceramics expert Hyeyoung Cho and Jungwon Park, the exhibition embraces the dual nature of Korean ceramics at this moment in time, where traditional and contemporary techniques coexist alongside one another, and celebrates the unique aesthetic this offers. Korea is a country where both serenity and dynamism co-exist, in the same way as the old and new exist together, and inform one another. The work of 16 artists/makers will be on show at the exhibition, including Sangho SHIN, the father of contemporary Korean ceramics, and founder of the Gyeonggi International Ceramics Biennale. Also on show will be work by Kwangsu SEO, a ceramic master specialising in large porcelain moon jars; Kwangyul YOO, a celadon master who has a longstanding family lineage in ceramics, and HunChung LEE, known for his contemporary interpretation of the moon jar and for his ceramic furniture. Pieces range across different types of traditional ceramics – from Onggi (brown pieces used for storing food), Celadon (jade green), buncheong (slip-treated), through to porcelain and other hybrids. Also on display will be a private collection of 200 traditional Korean ceramic making tools. The exhibition marks the first in a three-year initiative by the Korean Craft and Design Foundation (KCDF), ‘Constancy and Change Korean Craft’, to showcase Korea’s rich craft and design heritage by focusing on its different materials and forms of craftsmanship each year. Clay and ceramics in 2017 will be followed by wood and mother-of-pearl in 2018, and textiles and metalwork in 2019. Of all of the Korean crafts covered in the programme, ceramics is the most steeped in history and tradition. Bupgochangsin (法古 新), the Korean title of the ‘Constancy and Change Korean Craft’ exhibition refers to an expression first used by Park Ji-won, the respected philosopher and novelist better known by his pen name Yonsam of the Joseon Dynasty in the 18th Century. It describes the idea of creating something new by emulating the old, of knowing how to innovate using traditional skills and techniques, of creating new things from age-old roots. Ongoijisin (故而知新) of Confucius describes how it’s necessary to understand the past in order to see the future, while Changsin (新) means creating the new as emphasised in Bupgochangsin. 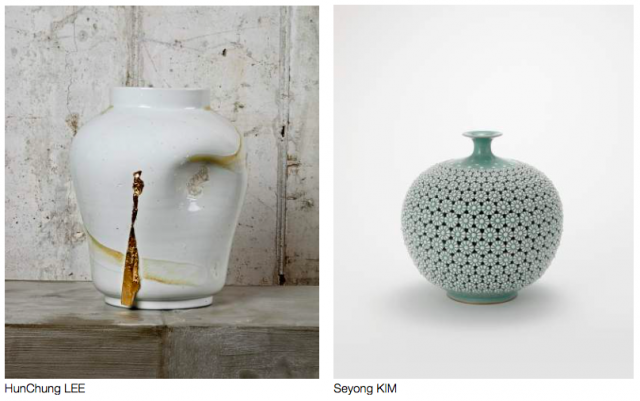 It was first initiated in 2013 as a way of exposing Korea’s authentic craft in Italy for the Salone del mobile in Milan.